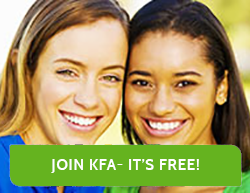 Join KFA to Learn How to Keep Your Child Safe and Healthy. Our award-winning community is the largest online support community for families raising children with food allergies. We have support forums for parents of babies, toddlers, 'tweens and teens. In our Food & Cooking support forum, you will receive personalized help to assist you with creating safe and healthy allergy-friendly foods for your family. Invite Friends to Join Kids with Food Allergies!